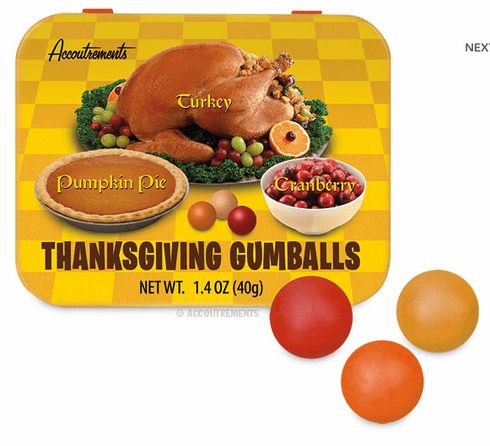 Enjoy the flavors of a festive feast anytime of the day with these Thanksgiving Gumballs! Each 3-1/4" x 2-1/2" x 3/4" (8.3 cm x 6.4 cm x 1.9 cm) tin contains about twenty-two delicious gumballs in the classic flavors of Thanksgiving - turkey, cranberry and pumpkin pie! Enthusiastically approved by pilgrims.